Leg rollers are great and effective for deep tissue muscle massage and they are vital for runners as well as others who take part in various types of exercises. Find the best selling range of leg rollers for runners below and also check out their reviews and ratings to decide which one you should be going for. NO MORE MUSCLE PAIN - Say goodbye to the morning back pain and stiff muscles caused by lumpy mattresses that keep you from doing what you love! The design of the muscle roller will allow for an effective deep-tissue massage that will knead better and deeper and help heal the muscle faster. ENHANCE YOUR PERFORMANCE - Use the foam rollers to warm up and cool down after workouts to prevent muscle pain and cramping. The rollers will stimulate the tissue and increase stamina and energy. INCREASE RANGE OF MOTION - Whether you're recovering from an injury or want to increase your flexibility, the foam rollers will help you make the process easy and painless! Use the foam rollers to stretch and increase your flexibility, and you'll soon completely forget how difficult stretching was at the beginning! 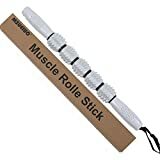 BONUS MASSAGE STICK - Get rid of aches and muscle tension on the go with the muscle roller stick! Whether you're traveling or at the office, the massage stick is tailored to target problem areas with ease. 2 ROLLERS, MASSAGE BALL & CARRY BAG - Two different roller textures, the outer rumble roller is grid textured, it is made from high quality,closed cell ethylene vinyl acetate (EVA) material, whilst the inner roller is made from high density EPE material. LIGHTWEIGHT - weighing just 2.2lbs and measuring 33x14cm, Prime4Design roller comes in its own handy travel bag. We have also included a massage ball so you have the whole set! BONUS ACCESSORIES - comes with free travel bag - making it portable, space saving and easy to carry. Free massage ball - great for deep tissue massage, muscle aches, increases blood circulation, roll away deep muscle knots and tight muscle areas. Your very own portable fitness / physiotherapy assistant tools comes with a user friendly exercise instruction guide to help you get the most out of your new workout equipment! 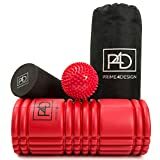 LIFETIME GUARANTEE - We are very confident you'll love Prime4Design Foam Roller set, but If you are not completely satisfied with your purchase, simply let us know and we'll refund you in full. What are you waiting for! Stocks are selling fast and won't last so click the ADD TO BASKET button now to start benefiting from deep muscle relaxation and experiencing more comfortable days. IMPROVED PERFORMANCE: specifically designed to create pressure that releases trigger points and loosens knots in muscles. Great for physical therapy, before or after exercise to help increases oxygenated blood flow through the muscles. The extra boost of blood flow allows you to recover faster and improve your performance to reach your next fitness goal. No need to pay for pricey sports therapy massages! FAST, EFFECTIVE, NATURAL PAIN RELIEF: this massage tool instantly soothes sore and aching muscles. Most of us know how good it feels when the physio massages and releases the tension from muscle knots. Now you can massage your entire body and relieve yourself of the good kind of pain. It's also great to have a partner massage you so that you can enjoy it even more! MASSAGE ANYTIME, ANYWHERE: control the pressure and focus on your key areas. You can easily target specific muscles in the neck, back, arms and legs that sometimes can be slightly awkward with a foam roller. Also portable and lightweight so you can take it with you when you go to the gym or travel. On the other hand, if you are very busy, you can even massage your muscles while watching TV at home! ENHANCED FLEXIBILITY & INJURY PREVENTION: effectively stretches the muscle fibers, tendons, and ligaments. Loosening your muscles helps prevent injuries. Great to use before working out to allow muscles to warm up. 100% MONEY BACK GUARANTEE: aren't 100% satisfied with your muscle roller stick? You can get your money back within 30 days - it's risk-free! Your satisfaction is always our #1 priority. Used for massaging the right points of the body, promote the blood circulation. 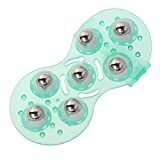 With 7pcs rolling metal ball which can be 360-degree rotated, allowing you to massage anywhere of your body like your face, head, shoulder, neck, back, leg, hip, etc. ROLL IT ANYWHERE YOU HAVE TENSION: Roll away tension in your legs, arms, neck, back, feet and the rest of your body. Target areas other massage tools simply can't reach. DURABLE, HIGH QUALITY: The muscle stick is made of a premium plastic grade and 7 sturdy rollers that will last over time. 100% MONEY BACK GUARANTEE: Your satisfaction is our top priority. If for any reason you are not fully satisfied, we'll refund your money, no-questions asked! This product relieves and regulates muscle soreness, helps restore, reduces muscle stiffness and pain before and after exercise, running and training. Regular use can increase your muscle strength and reduce the risk of injury. Our massage sticks allow you to apply a lot of pressure, as long as you can control the pressure and thus control the pain, depending on your pain tolerance. You will definitely notice that regular muscle use before and after exercise can lead to reduced muscle fatigue! 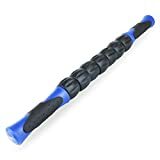 Muscle roller sticks are recommended by physical massage therapists and exercise trainers and used by thousands of people to enhance their workout and physical exercise experience and recovery. Suitable for calves, hamstrings, back, buttocks, limbs, neck and shoulders. Great design - Made of high quality industrial strength materials for durability. The handle is made of thermoplastic rubber and polypropylene, ergonomically designed for comfort. There are 5 ABS independent rollers on the steel core, which is sturdy, light and smooth. After-sales guarantee: If this muscle roller can't be your best friend, you can get a refund, customer satisfaction is our top priority. Please feel free to contact customer service, we will replace or refund for free, we guarantee that you will not lose money by purchasing our products. Please rest assured to buy!